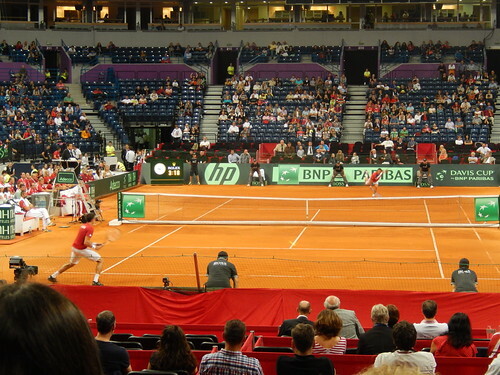 We really had a fabulous time at the Davis Cup Semifinals this weekend here in Belgrade. The Serbs defeated the Canadians, 3-2 with two thrilling singles victories on Sunday. Serbia now hosts the Czech Republic in November for the championship, going for their second Davis Cup title. They last won in 2011. The amount of great tennis players this small nation of Serbia produces is extraordinary. Besides having arguably the best player in the world, Novak Djokovic (photo above) they also have on the men’s side, Janko Tipsarevic, ranked number 18 in the world and Viktor Troiki, before he was suspended for missing a drug test, was ranked as high as #12. Serbia also has a top doubles, player, Nenad Zimojnic, who is a former number 1. Playing for Canada was Milos Raonic, who was born in Montenegro and Daniel Nestor, born in Belgrade. On the women’s side, they have two former number ones, Ana Ivanovic (#15) and Jelena Jankovic (#10) and Bojana Jovanowski, coming up the rankings at #39. Another ethnic Serb, Tuzla native Andrea Petkovic was #9 playing for Germany before her injury. Why so successful? First the Serbian people have many tall, strong, and athletic genes flowing through the population. The Serbians are good at all sports and despite a poor infrastructure for sport compared to richer nations, they do extremely well on the world stage in most ball sports, especially water polo, basketball and volleyball. The atmosphere in the Belgrade Combank Arena was thrilling and it is a different experience watching live as opposed to on television. The crowd was totally into it and I am excited for the finals. The Serbs should win if Nole (Djokovic’s nickname) wins his two matches and Tipsarevic can beat the number 51 ranked Radek Stepanek or 46th ranked Lukas Rosol. 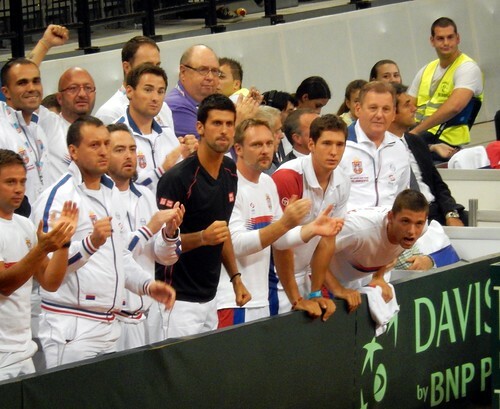 With the home crowd behind them, Serbia should defeat the defending champions. It may come down to Berdych versus Nole if all goes according to plan. It will be a fantastic match. A special thank you to Kevin and Lara from the Canadian Embassy for inviting us to the final day. It was fun to be a part of the Canadian fan delegation. They were almost more enthusiastic than the Serbian fans. 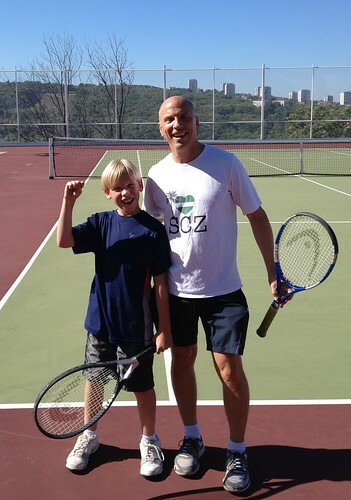 Probably the best tennis of the weekend came from the ISB Tennis Courts however, with Dad (me) playing against Owen, Ollie, and Nadia. It is great to have nice courts at the school that we can use anytime.